1st ed. Novato, Calif, Underwood-Miller, 1990 (left). Also London: Xanadu, 1990 (right). Description: xvii, 310 p.: ill.; 24 cm. "Dylan's true autobiography, as with any artist, is his work, in which he consciously and unconsciously shares everything that occurs in his inner and outer life. It is my hope that by discussing Dylan's performances chronologically this book may serve as a catalog, the merest beginnings of a guide, to the story of Bob Dylan that he himself has told and is still telling, every time he sings, every time he steps up to a microphone, every time he lets the music flow through him." "Dylan is a passionate vocalizer of felt truth, tongue connected directly to the heart, mind following not leading. The rhythm and the performance structure come first, and the language fills in the spaces. Those who perceive specific symbolic references in Dylan's songs (this stands for that) are almost always barking up the wrong tree- they assume that discovered meaning must necessarily have been encoded by conscious intellect. Dylan's technique skips steps- his "symbolic" language is intuitive, not rational, felt not preconceived. His songs entertain our intellects but their source is visceral- mind follows feeling. Feeling is first for the listener, too, but Dylan's cleverness with words is so striking we may not always notice that his songs make us feel first, and our thinking about them comes later." "This solo piano performance of "She's Your Lover Now" would still be remarkably compelling if the words were in some unknown foreign tongue, and all of our understanding had to come through the piano and the sound of the words, the sound of Dylan's voice. In fact the discussion of the lyrics of the second verse barely scratches the surface of what the performance of the verse communicates. Dylan uses English like a billiards player, putting a new spin on every word- every sound from his mouth has a life of its own, and is capable of conjuring up worlds of meaning, nuance, complexity." Over and over, the reader is inspired to put down the book in order to listen to a particular Dylan performance again. Includes discography, filmography, bibliography and index. Reviews: "A gem of a book with fanatical leaps of real insight." -Sam Shepard. "It's about time someone took a look at Dylan the performer, instead of constantly comparing him to Dylan the poet. He has that scary intensity as a performer that hasn't before been translated to the critical realm." -Jerry Garcia. Anything Paul Williams writes about Bob Dylan- and always in his wonderfully unpretentious, conversational, and heartfelt manner- is worth reading. 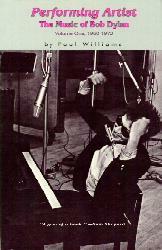 Performing Artist immediately enters the canon as one of the few necessary books on Bob Dylan." -Jonathan Cott. A short excerpt of the book was published in Telegraph 30, p. 74-76. Also reviewed by Anthony Kapolka, August 1990 on RMD. Author Interview: From Derek Barker (BD) interview of Paul Williams (PW) in Isis Issue 32 (August 1990) . . .
DB: So why have you now written Performing Artist, why not a biography of Dylan? PW: I didn't want to write about the person, I wanted to write about what this person has created, his art, his music. I've met the person a few times but I don't know him, except through his music. There, we are very close. The music and I have met thousands of times, over the course of 26 years. Shakespeare, Van Gogh, Beethoven all lived in earlier times, but Dylan to me is an obviously great artist who is here now, my contemporary, and for me going to a Dylan concert is like going over to the Globe to see Shakespeare perform his new play, an extraordinary opportunity, not to see the person but to see and hear the performance. He continues to produce great art. Not everyone understands this. Many people think Dylan did all his great work back in the 60's, and this misunderstanding also gives me a reason to write, not only am I fortunate to be present at the unfolding of the life work of a great artist, but much of his best work is unknown or underappreciated, and so I fantasize a useful role for myself, defender of the faith, tour guide to marvels misunderstood or still unheard. What also makes it fun is that while a great deal has been written about arts such as painting, literature, and composed music, performance-- probably the oldest art form-- is the least discussed, because until recently you had to be there at the performance in question. I live in a room piled high with tapes of Dylan performances from all over the world and from across three decades, and these tapes universalize the art form the way books did for the spoken story or reproductions did for painting. Now you and I can at least imagine we've experienced the same performance, and can argue and enthuse about it to our hearts' content. DB: This first volume ends when, 1973? PW: Right, it ends with the artistic reawakening which became Planet Waves. Planet Waves marks the beginning of the second stage of Dylan's relationship with his audience. The books chapters are split basically into tours, so volume two will begin with the 1974 'Comeback Tour'. The irony though of course, as we would understand, is that my real purpose behind writing the book is in the second half. I mean to talk about what other writers haven't talked about, to talk about how good the tours are, how good the shows are and to look at Dylan artistic achievements since 1974. DB: It might be an absurd queston, but why has Dylan been touring so intensely since what, February '86? That's over four years now, is he bored, has he nothing else to do? PW: In a very slight way you could say yes, but I would much rather look at it in a positive way and say he tours because that's who he is. I mean why does Picasso paint? Because there is nothing else to do. Dylan performs because that's what he lives for, you know, not because he has an idea that that's what he lives for, but because it's his experience that that's what life's about for him. I mean there was a point during 1980 where he was probably losing money on his touring, when you switch from, you know 15,000 seaters to 3,000 seaters. But his response to that was not to change his act. His response was just to play! I think that the natural state of Dylan is to be on tour. The unnatural state is when he's NOT touring. On the Isis rating scale of * to *****, Derek Barker rated this book as ***** +. Excerpts from his long review (in the same issue as the above interview) follow. Performing Artist certainly reads like a "whiz". It is made easy by Paul's beautifully flowing style of writing. Jonathan Cott calls Williams' ... book ". . . wonderfully unpretentious, and conversational. . . "
Williams: "Throughout Dylan's career we will find that although he has a reputation as a master of words, his mastery is more specifically of performed language-- separated from his performance, his words can lose their power and even their meaning." In truth, although many people see Dylan as a 'poet' there are only very few instances where his art reads better than it sounds. Paul revealed to me in our conversation that one of those rare instances for him is 'No Time To Think'. Other songs like, 'Rolling Stone' and 'The Times They Are A-Changin' do not work well on paper. I really don't think I've been so captivated by a book since I bought my first copy of Scaduto, which now seems like light years ago. It takes a rather special talent to produce such an easy to read commentary on such a complex subject matter. This is certainly a book for the scholars but you certainly don't have to be a scholar to enjoy it. "Finding myself hopelessly drawn to and deeply enriched by the song decades after I first heard it and rejected it is a warning and promise of how much else I may have been deaf to, how unlikely it is that I will in a lifetime discover even all the high points of what Dylan's opus has to offer me . . . "